Iaido is Japanese sword drawing. It was created by the Samurai to defend against surprise attacks by an armed opponent. Most iaido involves the practice of pre-arranged forms, which are excellent tools for training the body, improving concentration, and entering into a meditative state. Finding a talented instructor in iaido with legitimate credentials is rare … in the Midwest it’s practically unheard of. For those with a desire to compete in swordsmanship for sport, kendo is the activity of choice. Those who are willing to endure an occasional whack on the head may pursue bokken kumite (sparring with wooden swords) with our director’s authorization once they reach black belt at JMAC. Read more about iaido at JMAC. Judo was founded by Professor Jigoro Kano. It is both a martial art and an Olympic sport. It includes throws, pins, joint locks, and chokes. It is among the most vigorous of martial arts and is very popular with children as well as adults. The Japanese Martial Arts Center offers classes in judo for children as young as 6 years old, and for adults (starting at age 16). One fact not widely known is that sport judo is a narrow cross section of the complete art of judo. Proponents of the entire art, such as Satoh Tadayuki Sensei of Waseda University in Tokyo, recognize that the founder’s vision encompassed not only “judo” throws, but joint locks, takedowns, redirection, strikes, vital points, dynamic ukemi, kata, and weapons. Judo training at JMAC includes many of these opportunities. Read more about Judo at JMAC. Jujutsu - which is also written "jujitsu" and "jiu jitsu" - is the ancestor martial art of aikido and judo. Although it includes many of the techniques found in aikido, as well as many more combative techniques that did not find their way into aikido, the philosophy of jujutsu is more practical. Techniques are applied more directly, with a greater emphasis on pain compliance. Those who study jiu-jitsu over the long term improve their fitness, concentration, and ability to defend themselves. The Japanese Martial Arts Center offers serious jiu-jitsu classes for adults starting at age 16. 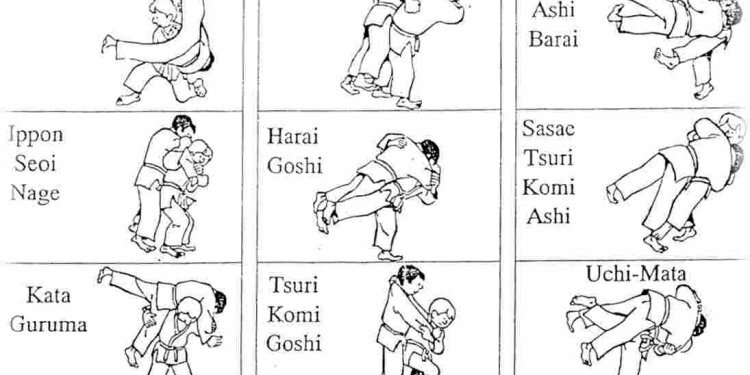 You can learn more about the differences between Japanese jujutsu and Brazilian jiujitsu. Karate involves mainly strikes, kicks, and blocks. It was originally developed in the Ryukyu Islands (now Okinawa), and was later exported to Japan before finding its way around the world. Karate is an excellent martial art for those who prefer striking, and helps develop physical strength, stamina, and confidence. There are many forms of karate taught around the world today, including Shotokan, Shorin-ryu, Chito-Ryu, Goju-Ryu, and Kyokushinkai. If you’re looking for a way to help your child learn enthusiasm, fitness, discipline, and manners while having a lot of fun, consider the kids karate program at JMAC. We have an incredible core of talented instructors who have made it their business to inspire kids to be their best. Read more about our karate program for kids. Kendo is a sport descended from Japanese swordsmanship. In Kendo, participants wear padded armor and attempt to score points by striking vital points with bamboo swords called "shinai." Practice is fast paced, involves much spirited shouting, and is a lot of fun. The Japanese Martial Arts Center does not offer kendo, but can refer you to a reputable kendo instructor in the area. Kung Fu is a Chinese martial art that actually includes many sub-styles. Like karate, kung fu involves strikes, kicks, and blocks, but also includes many esoteric motions that can be applied to take down or otherwise defeat an opponent. Kung fu often appeals to imaginative people because of the many references to animal forms, but it is also a very challenging and practical martial art. MMA (mixed martial arts) to a modern competition-based collection of techniques. Most MMA schools teach striking as well as grappling. Although not a traditional martial art - and thus lacking many of the character development and spiritual aspects of ancient Asian arts - MMA is nevertheless a fantastic form of exercise and a lot of fun. Because many MMA fighters have employed judo and jujutsu successfully, the Japanese Martial Arts Center offers private instruction to top-level competitors as well as occasional workshops for our members.